Understanding how Embeds work is key to understanding how data is stored, manipulated and displayed in neatComponents. The Embed Tool in the Text Editor enables you to embed a wide range of items onto the page, or component surface. 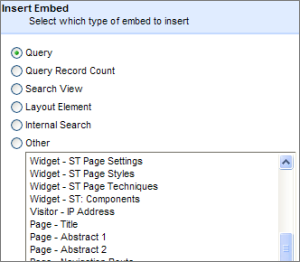 The embed will cause the output from one component to be made available on that page, either for display via a View or for use by another component. The method of constructing data management using Feed - Query - View is explained here... where we explain how information is brought into the site using a Form or Feed to bring data into a Table. That data is then manipulated by a Query to extract the information required by the website or application. Although individual Components can display output directly, the result is most often made available on a webpage by means of a View which is embedded on a page. Queries, Table Fields and Custom Views are all commonly embedded on Pages to produce the exact display the site developer is aiming for. For example, this is a page from a blog application showing how multiple table Table Fields are embedded on a single page combined with the output from three different Queries. The display is further combined with static text, and in this case, an HTML-table to set the layout. Font, color, navigation, access permissions, etc are all set elsewhere. 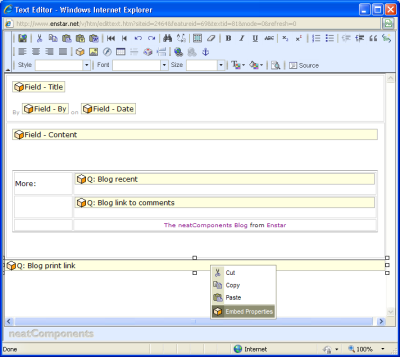 Each embedded component is configured by selecting it, then right-clicking and selecting 'Embed Properties' from the context menu.